April 1 - 30 in support of the Stephanie Alexander Kitchen Garden Foundation. From 1-30 April 2019 restaurants cafés food retailers and producers will join the Stephanie Alexander Kitchen Garden Foundation to raise funds to help Australian children grow harvest prepare and share fresh seasonal delicious food in order to form positive food habits for life. Food lovers can treat themselves in the name of a good cause from 1 - 30 April by joining forces with the Stephanie Alexander Kitchen Garden Foundation for its fundraising campaign Turning the Tables. After Turning the Table's huge success in 2018 raising $60000 the stakes have been raised with the aim of hitting $100000 in 2019. Funds raised will allow the not-for-profit to continue to lead the way in pleasurable food education supporting more than 1900 schools and services across Australia from early childhood through to primary school and into secondary education to teach children and young people positive food habits for life. For the month of April diners can opt to add a small donation to their bill or drop a coin in a donation box at participating restaurants cafés and food retailers to support inspire and inform educators to make positive change in the food habits of a generation. With a bunch of top-notch venues getting on board there's plenty of choices including some of last year's favourites Rare Hare Pastuso Grossi Grill Geralds Bar and Ezard along with newcomers Earl Canteen Tulum Greasy Zoes Gapsted Wines and The Kitchen Door at Penny's Hill - to name a handful. For those who love the thrill of the chase save the date! An online auction will take place from 18 - 28 April where individuals can try their luck at nabbing dining gift cards for a steal. Featuring the likes of Brae Estelle Donovans Phillippa's Market Lane Coffee and many more of Australia's finest establishments - including a very special experience with Kylie Kwong - it has never been sweeter to get bidding. Culinary masterminds Julia Busuttil Guy Grossi Kylie Kwong Alejandro Saravia and Matt Wilkinson are also behind the cause as campaign heroes along with fresh-food advocates Miranda Sharp and Jane Grylls and Kitchen Garden Program alum turned-chef Emma Cook. 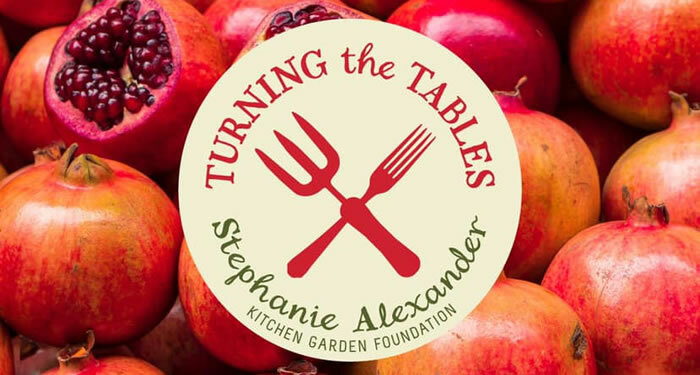 "Turning the Tables an initiative of the Stephanie Alexander Kitchen Garden Foundation needs help to support the expanding food education movement in Australian schools and early childhood services. Our kitchen garden students quickly develop an active interest in all aspects of growing and enjoying fresh delicious and responsibly produced food. I hope that food lovers everywhere will want to support this campaign" says Stephanie Alexander AO. The Stephanie Alexander Kitchen Garden Foundation was established by restaurateur and food writer Stephanie Alexander AO in 2004. The motivation for this work came from Stephanie's awareness of the growing childhood obesity problem in Australia which she felt was largely caused by people simply not knowing how to prepare and enjoy fresh seasonal food.